These vintage pumpkins will add a little mystery and mirth to your Halloween. They are made from paper that I glued together. The same image is on all "sides" of these earrings. The black crystals add a little bit of luster to the matte surface of the paper. Since these earrings are made of paper, please do not let them get wet. 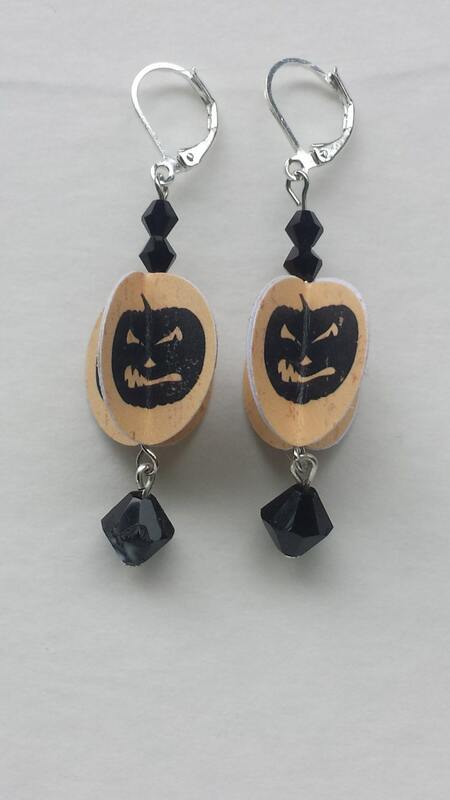 This pair of earrings will be a nonfattening treat for your Halloween. When purchased, the earrings will be boxed and then placed in a padded envelope. FREE SHIPPING! If you would like to see these earrings with gold findings and/or different colored crystals, just convo me. I would love to work with you.